When is a CD review not a CD review? When you don’t have a CD player on your European trip. 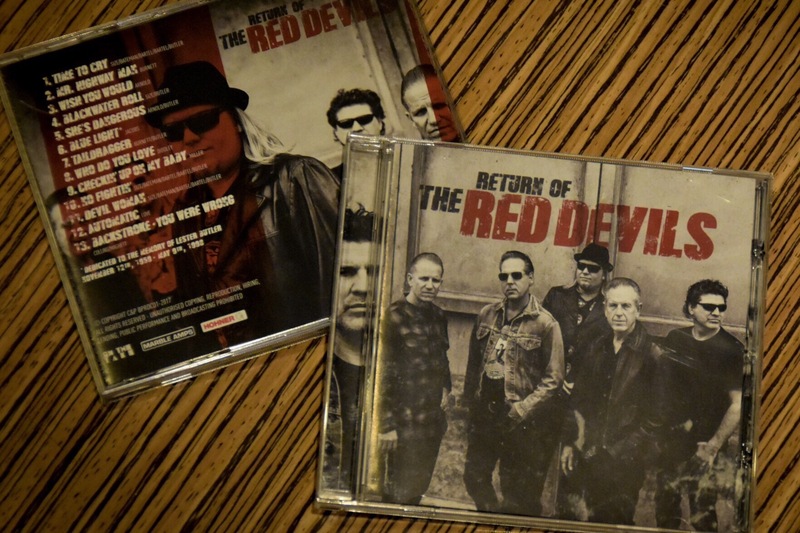 That’s us with the new tour disc “Return of The Red Devils” (BPRDCD1-2017). We have the album, but nothing to play it on. That technicality won’t stop this first-look review from happening. The disc was recorded live at De Bosuil, Weert, NL on June 3, with one track, “Wish You Would,” coming from the June 2 gig at Fluor, Amersfoort, NL, the first gig of this summer reunion. Good strategy to have this product recorded and out by the time the ZZ Top tour rolled around in July. 1. “Time to Cry.” Credited to the original lineup, it seems that a name has been agreed upon, as this song has been credited in various places at “Time to Cry,” “Your Turn to Cry” and “The Backstreet Crawler” on 1994’s “Blackwater Roll” EP. In fact, on tour, Big Pete has been singing “backstreet crawler” on the first verse, and then switching it up to “your time to cry” after that. 2. “Mr. Highway Man.” This has been the band’s opener on these recent shows. 3. “Wish You Would.” Billy Boy Arnold (mistakenly credited on initial “King King” pressings as “Billy Ray Arnold” built an empire around this cut. No “I” in this song title. 4. “Blackwater Roll.” Credited to Size and Butler, this is a lick Paul Size has had for a while, heard on the EP of the same name as well as the “Return of the Funky Worm” disc. 5. “She’s Dangerous.” The only “King King” song that has all-new credits. The original cut, a classic Chicago stop-time number, was credited to Willie Dixon. Here it is given the Devils’ driving live arrangement, now credited to Billy Boy Arnold and Lester Butler. The groove is much more like Billy Boy’s “I Was Fooled,” covered by Big Pete on his “Choice Cuts” album. 6. “Blue Light.” The Little Walter instrumental is dedicated to the memory of Lester Butler. “King King” and “Return of” both feature slow Little Walter blues numbers. 7. “Taildragger.” Credit Burnett and Butler, title is now one word. 8. “Who Do You Love.” A great arrangement taken from Butler’s performances 25 years ago. Glad this one made it to disc. 9. “Checkin’ Up On My Baby.” Of course this is on here, and being played live this summer. This song was the last officially released Red Devils tune — coming out on the Mick Jagger hits album of a few years ago. If the band can make this connection through the tour, that is a good thing. 10. “No Fightin’.” Credited to the entire original lineup, which was a key reason we picked that title for our website. 13. “Backstroke / You Were Wrong.” In case this song has confused folks from mislabeled YouTube videos, here the band splits the difference and credits it to Albert Collins and Magic Sam both. Seven cuts from “King King” made this new list, but the arrangements aren so markedly different on some (especially “She’s Dangerous”) that they are not a letdown here. We will have a full review once we can actually listen to the disc! This entry was posted on July 25, 2017 at 10:00 am and is filed under red devils with tags Return of The Red Devils, reunion tour 2017. You can follow any responses to this entry through the RSS 2.0 feed. You can leave a response, or trackback from your own site. I shall be getting mine at Bluefunk in Poynton on the 29th. If anyone attending the euro shows could pick up merch and ship to USA, I would greatly appreciate it! Brian, shoot me an email at jjperry@nofightin.com. It’s a shame they just sell it at gigs. I think job 1 was having merch while on tour. The band has no distribution, so setting up a commerce site, shipping, etc. is probably not the priority right now. That’s my guess anyway!